Welcome to WEEK TWO and we’re starting to develop the description of characters in our storytelling. Using the first person you are going to write in a couple of different voices. The photo of the ribbons is like the mother prompt as each ribbon represents a new choice and a new person. I think it helps if you have people you know as your starting point so you’re moving from a kind of reality to something more imaginary. To give you an example, a family member of mine chose the orange ribbon on the right to represent what might be unfolding for him and I enjoyed imagining the detail suggested by its colour, texture, length and position relative to the other ribbons. Prompt 1 Use pen and paper for this exercise. Choose one of the ribbons and start to write notes about its appearance. 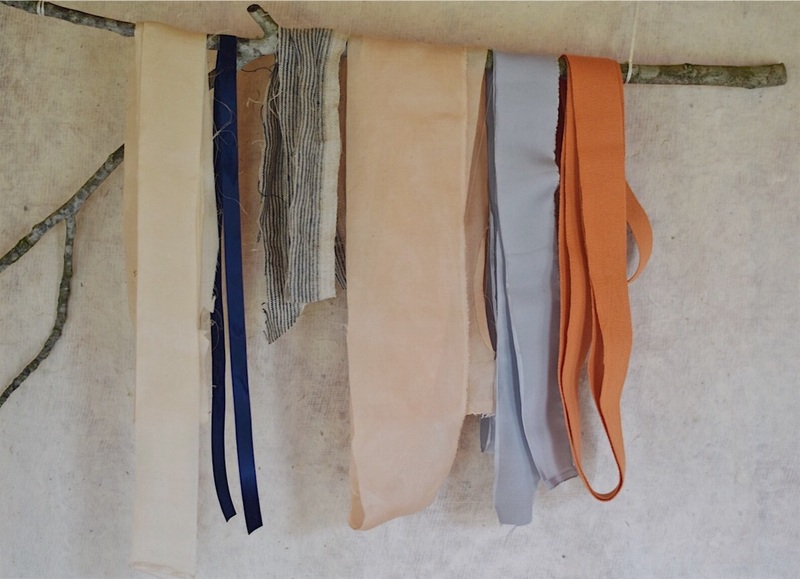 Move on to the associations you might attach to colour, texture, length and position, for example the orange one remind might remind you of a desert sunset or the cloth on a faded deck chair. Prompt 2 Do the same exercise with another ribbon. I suggest you go for a good contrast. Prompt 3 Refer to the mapping you did in Prompt 1 and have a go at a piece of free writing. You’ll probably write as yourself this time which is natural and good. I’ve chosen this black and white ribbon for its colours alone. It came as gift wrap from a department store and is more paper than textile. Black and white, opposites and contrast, can be seen from a distance, makes a statement, represents flour and coal or good and bad; a reminder then of difference. There’s a word that opens up the discussion of who I am and what my issues are. My ribbon is black with golden thread running through it so it shimmers in the light. I saw a picture in a magazine of a wall in black with brass framed mirrors and art work and it looked amazing. Black is actually cosy and I love the idea of something unexpected. Anything different, I’m not what you think. Try out a few of these, writing just a couple of lines for each persona. Prompt 5 Your last prompt and you’re back to writing in your own voice. Write about something you cherish and explain why you love it and consider what your choice might say about you. You can see mine in the last photo. As last week, I’ll be posting my responses on the Facebook page (link is here) and on Friday I’ll paste the response for prompt 5 for those of you who aren’t on Facebook. I’d love to hear any feedback from you via Instagram or a comment in the box below. Prompt 5 I’m writing about the crystal in the the photograph. 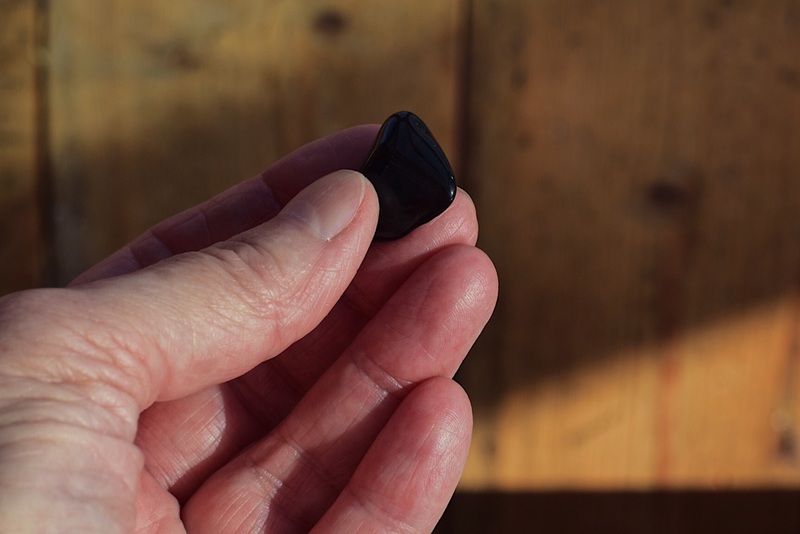 This black stone is called an Apache tear, a kind of obsidian used to help with grieving and sadness. I take it everywhere. Given to me when my beautiful German Shepherd left us. We don’t have him any more, is the phrase used when someone asks, less painful I guess. He’s gone and there’s an emptiness. His presence is still felt along the lines of what would Max say, applied to all manner of situations. It helps. Our perfect companions never have fewer than four feet, said a famous writer. I think dogs and writers are a thing.